After the first Ani-Time shoot with all the 7 finalists, the next event in our itinerary was the grand photo shoot. A part of the shoot is that we will have a set of photos with our own costume and the other set would be with clothes from SugarFree and Blue. 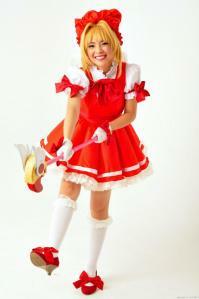 The costume that I wore for the cosplay set is…Card Captor Sakura! Sakura Kinomoto is a character that has been a part of my childhood along with a few more characters (which I will be cosplaying in the future!). I watched Card Captor Sakura from beginning to end. It was an anime I really can't forget! And so, cosplaying her is a really an unforgettable and special experience for me. Oh yeah, if you're interested in creating your own Card Captor Sakura baton/sealing wand, you can check out my entry in the How-To label in this blog. Next up is the set with clothes from SugarFree and Blue. SugarFree and Blue's line of clothes are inspired from anime and Harajuku fashion. SugarFree and Blue was the official clothing sponsor for the ANIMAX Ani-mate Search. They really have fabulous clothes and I'm honored to have modeled one set for them.